Few European countries remain in recession in Europe, but Spain is one of them, and with over ten per cent of her economy dependent on tourism the country will be hoping for a sparkling summer next year. Tourism has been hard hit by the economic recession as holidaymakers seek cheaper destinations. Spain, which is still experiencing her first recession since 1993, has seen a sharp decline in visitors from other European nations, especially the UK. This is largely due to the fall in the value of the British pound compared to the euro. This is particularly devastating because tourism makes up over 10 percent of Spain's Gross Domestic Product. Arrivals from the UK accounted for 28 percent of all foreign visitors a couple of years ago, but that has been dropping recently. Painting an even grimmer picture, many of those former visitors are said to be heading to destinations like Egypt and Turkey. Despite the gloomy outlook, Spain still has a lot to offer to visitors, especially in the Balearic Islands. A mainstay of Spanish tourism, these islands offer an amazing climate, with roughly 300 days of sunshine. Beautiful beaches and a rich cultural heritage also add to their appeal. One of the best known is the island of Menorca, which has been listed as a Reserve of the Biosphere by UNESCO. Second in size to Majorca, Menorca has a resident population of roughly 88,000. During its early history, ownership of Menorca changed hands many times. The island was initially used as a base by pirates. Some of the architecture of Menorca has retained its British influence. The Treaty of Amiens in 1802 saw the island ending up in Spanish hands. Menorca offers visitors an experience that will last a lifetime. In the old capital, Ciudadela is a medieval fortress of great interest to most visitors. If you are looking for some history on Menorca, this is a must visit town. In the city visitors can walk through the narrow streets to see old churches. The numerous shops and bars are popular with visitors. There are two museums in Ciudadela, the Museu Municipal and the Museu Diocesa. These offer an interesting glimpse into the country and its people. Steps leading to the waterfront will open up a whole new side of Menorca. Here visitors can take boat rides or enjoy the cuisine in one of the restaurants. Bar hoppers will find many venues to sample. A trip to Menorca would not be complete without visiting one of its over 50 beaches. One of the most well known is Cala Pregonda. It is ideal for anyone who wants a quiet, secluded spot. It is a long walk to get there, but there will be no complaints once you experience the beauty of the area. 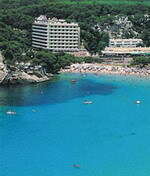 The Cala Santa Galdana is likely to attract more of the touristy crowd with its modern facilities. It is a great spot for photography enthusiasts. The shallow waters make Cala Santa Galdana a popular beach with families. The Son Bou Beach is the longest on the island. Its wooden path leads to three bars, so you will not go thirsty. This beach also offers a variety of water sports. Visitors are advised to be aware of strong currents and to pay attention to flags posted for their safety. The Cala Turqueta is notable for the fact that the beach is largely unspoilt. The natural coastline is not marred by the construction of modern facilities. It is considered one of the most beautiful spots on the island. Other well known beaches include Son Xoriguer, Santo Tomas and Punta Prima. 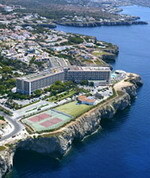 Menorca has the reputation of being an ideal destination for groups and families. It enables visitors the opportunity to enjoy the beauty of Europe on the cheap. Holidaymakers often take advantage of package deals to save money. Hotel accommodation varies, and there is something to suit every pocket. There are choices ranging from five-star hotels to bed and breakfast. Half board options (bed, breakfast and dinner) are also quite popular. And some Menorca property owners rent out their villas to tourists too. 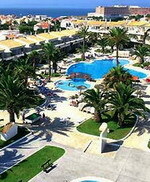 Many travel sites in the UK also offer special deals for anyone wishing to visit Menorca. The island presents an opportunity for anyone who wants to stretch their travel Euro. Even with the exchange rate between the euro and pounds, Menorca is affordable. 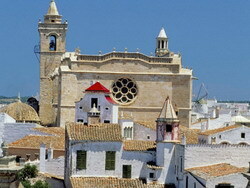 Menorca continues to allow the tourist a pleasant holiday, and could well be worth considering for a holiday next year. Ciudadela de Menorca - formerly the commercial and cultural centre of Menorca, with an astonishing amount of history and culture. There is plenty of nightlife in the city, and many restaurants and bars. 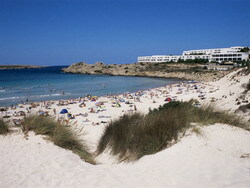 Although Ciudadella does not have its own beach, there are beaches nearby at Cala Santandria and Sa Caleta. Apartments Binimar is a pink villa-style complex of low-rise apartment buildings located 300 metres of the beach at Cala Picas, and four kilometres from Ciudadela. Guests have a choice of dining options around the complex including seasonal barbecued dishes at the open-air Royal Grill, international buffets in the main restaurant and snacks and pizzas at La Tasca. The restaurants also offer live music and cabaret shows on a regular basis. Drinks and cocktails are served at the Poseidon Bar as well as the open-air bar by the pool. The complex is centred round the lagoon-style swimming pool and children's pool, with palm-trees and ample spaces for sunbathing under parasols. A pool table is also available on site. The Apartamentos los Delfines is set 200 metres from the popular white, sandy cove of Cala'n Blanes, one kilometre from Ciutadella with its port, shops, cafes and bars. The hotel offers buffet-style dining in its large restaurant, which serves a variety of international dishes. The hotel snack bar sells light refreshments and the poolside bar is a summery setting for cocktails and refreshing drinks. After breakfast guests can spend the day lounging by the giant, palm-fringed swimming pool while their young children enjoy the safety of the adjacent splash pool. This modern complex consists of 102 fully equipped self catering apartments, each of which contains a separate sitting area and fully equipped kitchenette including microwave, cooker, refrigerator and kitchen utensils. The modern façade of this family orientated hotel and apartment complex lies 300 metres from Cala n Bosch's lively beach and marina. Sauna, steam room and beauty services feature in the indoor pool and spa centre, while the property's 10,000 square metres of garden house two further swimming pools, one especially for children. When not participating in daily activity and entertainment programs, kids can also keep themselves occupied in the children's park, or on the tennis and volleyball courts. Adults, meanwhile, can relax on the solarium, enjoy drinks and cocktails in the poolside bar, and later enjoy live music and a chance to sample local flavours in the contemporary dining room offering sea views. Offering magnificent views of the sea and Es Prat marshlands, Apartamentos Mar Blau is a modern holiday complex located near the beach of Son Bou, six kilometres from Alaior. Guests can relax with a drink or snack from the bar beside the swimming pool, set in gardens and overlooking the protected wetland area and the sea. Children have their own pool and a play area. The bungalow apartments have a light contemporary decor and feature furnished terraces which are all south facing with sea views. All are air-conditioned and include safes, kitchens, bathrooms, telephones and televisions. The modern Hotel Patricia, with its simple, white stucco façade reminiscent of classic seaside architecture, is situated next to the lively harbour in the town of Ciudadela. Guests can start the day with a Mediterranean-style buffet breakfast in the spacious cafeteria. Drinks are served under the impressive Art Deco-style glass dome in the saloon bar, or in the lounge, with its deep sofas and daily newspapers. 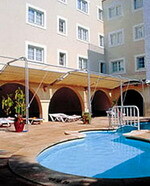 The hotel is centered round a patio with a swimming pool surrounded by sunbeds and parasols. Practical amenities include a round the clock front desk, multilingual staff and a currency exchange service. 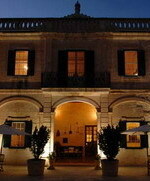 Ciudadela is the capital of the island of Menorca, famed for its historic port and Medieval parade ground. The nearest beach is less than one kilometer away. Mahon Airport is 30 kilometers from the hotel. The Hotel Almirante Farragut is a large modern hotel situated in the quiet Cala'n Fort bay, next door to shops, bars and restaurants, and 50 metres from the beach. Guests can enjoy a refreshing dip in the outdoor pool, soak up the sun on a sun bed by the beach, or sip a drink from the poolside bar. An array of water sports is on offer, and kids will enjoy the mini club and children's pool. Guests can also enjoy a work out in the gym or a pampering visit to the hair and beauty salon. Guests can choose from a variety of sporting activities; there is a biking centre, diving centre, hiking centre and canoeing centre. Guests can also play ping-pong, rifle shoot, or play volleyball and water polo. The hotel's main restaurant is open for themed buffet dinners and the Snack & Pool Bar serves light lunches and snacks. The RTM Audax is a modern seven floor hotel built on terraces on the hillside, surrounded by pine trees and 150 meters from the beach and estuary which it overlooks. The secluded gardens feature a two-tier swimming pool complete with a waterfall on the 6th floor. 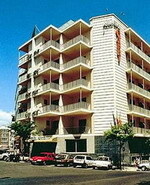 The hotel has two restaurants; the Alexandra serving an international buffet, and the Santa Galdana, again with a buffet and also à la carte menus available. A snack bar also serves lunch on the terrace overlooking the pool. The health and wellness center is the perfect place to workout or perhaps relax and take advantages of the range of spa services on offer. All 244 guestrooms have bright décor and modern furniture and feature balconies with views of either the sea, swimming pool or pine forest. 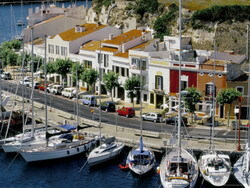 Mahon - Capital of Menorca, Mahon has plenty to offer. Shops and restaurants, plus a marina which is relaxing by day, and buzzing by night. Set in a beautiful natural bay, the modern spacious Barcelo Hamilton Hotel is located in the Menorcan capital of Mahon, 800 meters from the crystal clear waters of Cala Padera beach. Guests can bronze on the sun-drenched terraces next to the swimming pool, workout at the fitness center or relax in the jetted tub and enjoy the traditional Menorcan cuisine. The hotel's main restaurant offers local specialties as well as international cuisine in a buffet-style setting, with a light contemporary decor and relaxed atmosphere. The second restaurant, Sa Cova offers an à la carte menu in a formal setting with low-level lighting and terrace overlooking the sea. In the area, sports enthusiasts will find tennis courts, a golf course, and scuba-diving and horse-riding schools, as well as water sports, such as windsurfing, sailing, and underwater fishing. The Capri Le Petit Spa and Wellness Centre is a modern five story property situated in the center of Mahon, with attractions and shops in the vicinity, and less than one kilometer from the harbor with its lively assortment of bars, restaurants and shops. Guests can take a dip and admire the view from the roof-top swimming pool and hot tub (open-air in summer, glass-covered in winter), work out in the fitness center, or relax in the sauna or steam room. Massages and beauty treatments are also offered. The hotel's restaurant and pizzeria serves a range of pizzas and traditional Spanish dishes, while tapas snacks, sandwiches and drinks are available in the bar/café; alternatively guests may choose to take advantage of the room service. The 75 air-conditioned guestrooms have a bright décor and balconies and are all equipped with cable television, minibars and Internet access. Sant Lluis - a quiet village with a range of facilities - supermarkets, restaurants and bars, chemists, banks and transport connections to Mahon. 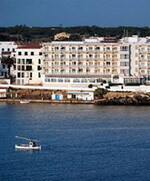 Barcelo Pueblo Menorca is situated on the outskirts of Sant Lluis, Menorca, Spain. 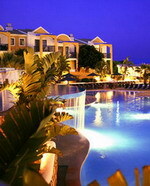 Punta Prima beach is 300 metres away. This contemporary beach hotel is set amid lush green grounds and manicured lawns. There are three swimming pools for adults with a poolside bar, and two for children. Restaurant Barcelo Pueblo Menorca features show cooking and serves a range of international dishes from an extensive buffet. 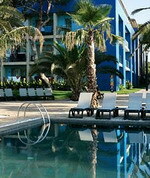 There are three bars located at Barcelo Pueblo Menorca, including a pool bar with an outdoor terrace. A playground and a children's miniclub are available. There are two outdoor tennis courts, mini golf, a volleyball court, archery, and a soccer pitch. A daily and nightly entertainment programme is organised for adults and children. Surrounded by beautiful beaches with crystal clear water this country estate stands out because of its old watchtower and over 100 hectares of grounds that guests can walk in at their leisure. The house dates back to the 14th century and the various extensions that have been made over the centuries have turned it into a neo-classical manor house. The front balcony and the pediment provide the finishing touches to this impressive pale stone building with large windows and green shutters that is reminiscent of the belle époque. The owners offer a great range of pleasures from a dip in the swimming pool, a drink at the El Racó del Poeta bar while watching the wonderful sunsets, a walk among the pine, holm oak and wild olive trees or tasting the home-made "sobresada".